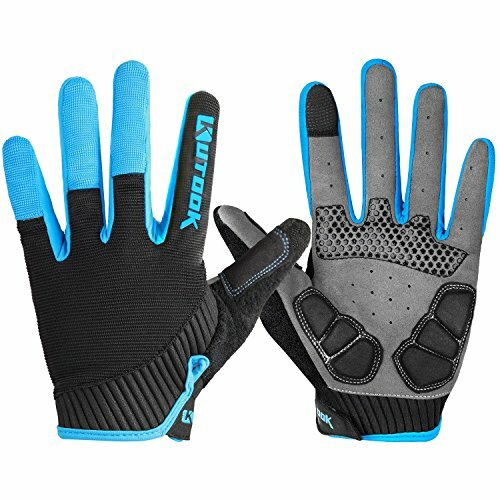 ⭐ Today we bring to review Kutook gel cycling gloves, great gloves for your outings to the road, both for cold temperatures and in summer. Its elastic padded tegido, and the gel protections make them ideal for the rounds of road in the bike, allowing the transpiration correctly and avoiding the appearance of blisters, with a total control over the grip. You can even handle the mobile without problems, thanks to your special tegido designed specifically for this purpose. Material: 28% Lycra, 24% Nylon, 12% Neoprene, 36% Synthetic Leather. Palm of the hand with gel filling, anti-shock and anti-slip. Touch screen design. You can touch the phone's screen with the tip of your index finger on these gloves. Good breathability and elasticity. Innocativi and light micro-network on the back. Logo and high quality velcro. Easy to use and ideal for cycling. Easy to use and ideal for cycling. Very comfortable and beautiful. And the best part is that even though they are very thin, I have been able to verify this winter that they help a lot against the cold. However, at the moment I have not had anything serious that they have put to the test and have protected my hands. However, with what I have used them for the moment, no complaints and happy with the purchase. I received them a couple of days ago and I have released them today. They are exactly as they appear in the photo and comfortable. Perhaps, they are a little wide (and they make it a bit difficult to use the phone), but one size less would have been a little bit fair .Also for the price they have, I do not know if there will be many better options. At the moment, I think it's a good purchase. I love gloves, they are of good quality, and they fit perfectly in the hand. They are beautiful, comfortable and perfect for summer. The price-quality ratio is unbeatable. Buy fully recommended. I have released them today, for a very extreme cold they will not be as efficient, but I have used them in a route of more than two hours with an average temperature of 6º and they have been perfect, in no time the hands have been cold.